The countdown is on! Our holiday break is just a few days away and I am beyond excited! Two whole weeks of lounging, snuggling, and doing all the holiday things. That's all my mind can even think about right now. With the break just around the corner, it's put this week into overdrive. We've had holiday parties, school programs, and end of season activities soaking up every free minute on top of the usual. Luckily, a few weeks ago I had the foresight to see how busy this week might get, and I was able to get my gift and party planning organized just before my brain became complete mush from holiday overload. Giving gifts is one of my favorite parts of the holiday season. The Cutes we decided to spread a little holiday cheer and get their classmates a fun little treat to enjoy over the break. We did a little brainstorming, and while most ideas thrown out there involved all things Frozen and ninja warriors (#boymom), we came up with a fun "Cookies & Cocoa" themed gift after seeing these adorable Santa themed milk bottles. The Cutes were instantly down with anything involving both cookies, marshmallows, and chocolate all in one so it was decided a winner. Originally I had planned on making one of my favorite holiday cookie recipes, but then life happened, and I started to get a little stressed about it. Fortunately, the good bakers of Publix decided to show me the light, and I found some yummy holiday sprinkled sugar cookies. With that little switch of plans this gift might go down as the easiest little gift to date. When I ordered the milk bottles, I also stumbled upon some cute packaging to pair with it. These little scalloped popcorn boxes were too cute to pass up, and the perfect size for what we had in mind. When everything arrived, all I had to do was add in some pre-mixed cocoa, a few marshmallows, and our sugar cookies. Now because I am me, I did whip up a quick coordinating gift tag printable to top it all off. I grabbed some cute ribbon, my favorite clear bags that I use for no-fuss packaging , and began my assembly line. Today we will be delivering our little gifts to all of our sweet little friends in L.C's class first, and I just know that they will be just as excited to receive as we are to give! Here's hoping the parents are just as excited with us even though we are slightly contributing to the holiday sugar consumption. 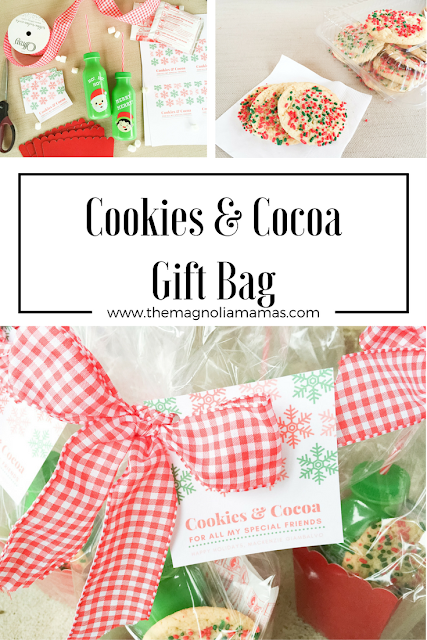 If you are interested, I've also created a non-personalized "Cookies & Cocoa" gift tag for you to download. Download the free "Cookies & Cocoa" printable HERE. Now off to spread some more holiday cheer!